Pick up passengers in the parking lot west of the terminal pictured above. Wait in the designated staging areas (open in Google Maps) Only drivers within one of the designated staging areas pictured above are added to the queue. Terminal 1: Drive down Glumack Dr, past "Parking" and "Commercial Lane." Stay in the left lane and continue toward "Ticketing" and "Departure Drop Off." Take a sharp left into the "App-Based Ride Services" section and pick up your passenger in the lot on the left side at doors 6 or 7. Terminal 2: Drive down Humphrey Dr, past "Commercial Lane." Take the next left in the "Authorized Vehicles" area. Pull over and pick up your passenger from the lot on the left side. Drivers at MSP are no longer required to pay $6 to pick up and drop off passengers. Instead, a $3 fee is passed directly to the passenger. Short ride bump: If you receive a request for a short ride from the airport after waiting in the queue, you may qualify for a higher queue position after you drop off your passenger. You'll receive an SMS after dropping off to let you know you have the option to return to the staging area for a preferred spot in the queue. Please note: if you give a ride before returning to the staging area, you may still qualify for a preferred spot in line. Do not pick up passengers from "Arrivals." Do not wait or circle back at the airport if the passenger is delayed. MSP requires you to leave the airport and kindly ask your passenger to request another ride when he or she is ready. Drop off passengers at “Departures” at the passenger’s carrier of choice, along either the North or South curb. In addition to the Lyft emblem, drivers giving rides at MSP airport must also display an airport decal. Beginning 1/1/2018, all drivers giving airport rides at MSP will need to have a decal displayed, in addition to the Lyft emblem. Drivers can fill out a preliminary form online at https://tncpermit.mspmac.org. All drivers will then need to go to the airport to receive their decal. The office where you can pick up your decal is located at: Landside Operations T2 Office, 3350 East 72nd Street, Minneapolis, MN 55450. There are approximately 35 parking sports reserved exclusively for drivers in front of the building for the permitting process. Enter from 34th Ave from 494 (the airport encourages using 34th Ave rather than Post Rd). When you turn onto 34th Ave, the cemetery will be on your right. Continue until you reach E 70th St and turn left onto E 70th St.
Continue until Humphrey and then turn left onto Humphrey. Head straight until you see an entrance on the righthand side at the white sign labeled “Authorized Vehicles Only.” Please park in the lot. *Use your Lyft app to verify driver status and vehicle inspection record (see sample below). Please make sure to keep a physical copy of your inspection form in your car at all times as well. The only accepted method of payment will be credit or debit card. The airport is unable to accept cash or check. Permits will cost $25, which will not be paid for or reimbursed by Lyft. 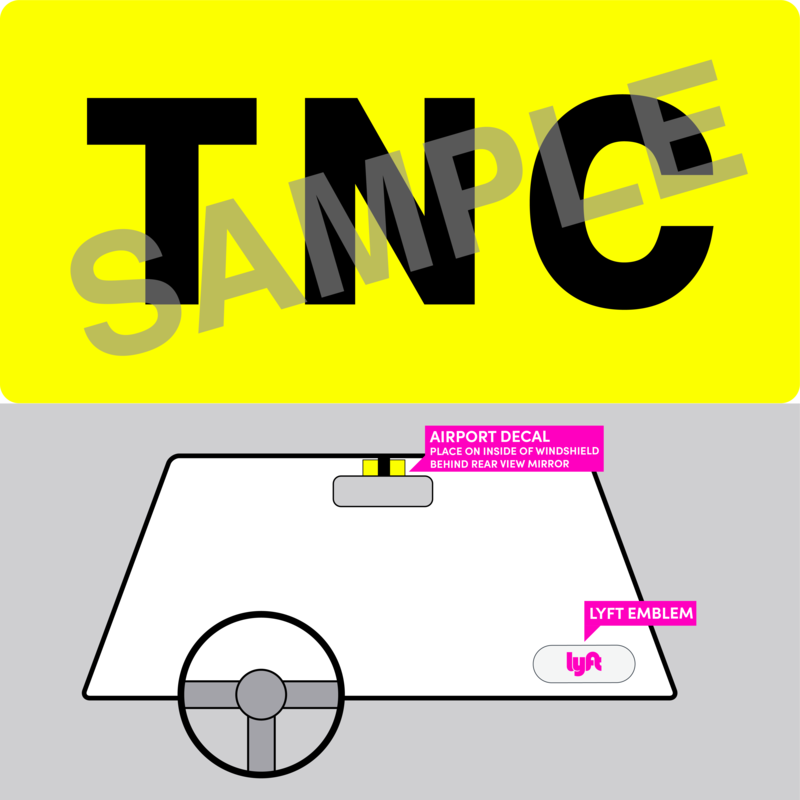 The decal will need to be placed on the inside of the windshield behind the rear view mirror (see example above). For support, drivers can contact: MAC Landside — email: tnc@mspmac.org or call (612) 467-0809. Pick up passengers from one of the pickup/drop-off areas pictured above. Drop off passengers at one of the pickup/drop-off areas pictured above.